Messier 13 (M13), also known as the Great Globular Cluster in Hercules, is a globular cluster located in Hercules constellation. Messier 13 is one of the brightest and best known globular clusters in the northern sky. The cluster has an apparent magnitude of 5.8 and lies at a distance of 22,200 light years from Earth. Its designation in the New General Catalogue is NGC 6205. The Hercules Globular Cluster has an estimated age of 11.65 billion years and contains about 300,000 stars. The estimated mass of the cluster is about half a million solar masses. 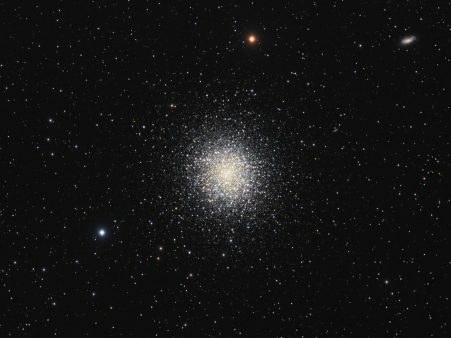 M13 stretches across 20 arc minutes of the sky, which corresponds to a linear diameter of 145 light years. The cluster can be seen without binoculars in exceptionally good viewing conditions, with clear skies and no light pollution.